So I finally decided to kick the drink! I don’t like to use the term ‘give up’ as I firmly believe that I’m doing quite the opposite. Giving up insinuates going without and by quitting alcohol I won’t be missing out, instead think my life is going to be so much better! Alcohol isn’t good for anxiety. No matter what website, book or specialist you encounter they will tell you the same thing. Despite this it is often those who suffer with mental health issues who drink the most. In fact about 20% of people with social anxiety disorder also suffer from alcohol abuse or dependence, recent studies have shown the correlation to be higher among women. These statistics may only be the tip of the iceberg as many who drink excessively do not make it common knowledge. It can be considered a way of escaping; as a crutch or coping mechanism. I used to think of it in the same way. I would rely on alcohol to “make myself feel better’ or as a way to try and dull the chaos in my mind. Deep down I knew that I was just throwing petrol on the fire but I didn’t want to believe it. I was so scared of giving up my coping mechanism that I would defend alcohol until I was blue in the face. I felt I needed it in social situations, that I couldn’t manage to be social without it. Alcohol would cause huge arguments, it would make me say nasty things I regretted, would ruin my sleep, and would wake me up at 4am feeling panicked. Alcohol gave me hangovers that filled me with dread and left me unmotivated and unwilling to leave the house. Alcohol robbed me of building any real self-confidence; instead I would rely on the false highs of the drink. Alcohol would make me wake-up in a panic, filled with regret wondering if I had offended anyone or embarrassed myself. Alcohol would often leave me feeling so wretched that the only way to feel better would be the following evening once I’d had a glass of wine. I felt scared at the thought of quitting but I knew that I wanted it so much. The good times from drinking were few and far between, I’d made so much progress with my mental health in the last few years and I felt like alcohol was the final piece of the puzzle. The stumbling block and the one thing holding me back. Help came in the form of a book – Kick the drink…Easily! by Jason Vale. I’m an avid reader and devour books, on holiday I can finish a book in a day! Whenever I have a free moment you’ll find me reading (if not cooking) and often in the evening I will read a book on the sofa with my husband while he watches TV. Now while I knew I could stop drinking once I had set my mind to it I was still very daunted and scared by the prospect. I knew I had excellent willpower and determination; I had given up smoking a few years ago overnight with no help and I was very good at giving my all to any task that was important to me. However I believed I would miss out on so much, no champagne on my birthday, no mulled wine at Christmas or cocktails by the pool. How would I talk to people at parties? Or enjoy dancing on a night out. In short I had the fear. This is where the book was amazing and I would recommend anyone who wants to stop or cut down on drinking should give it a read. In fact anyone who drinks alcohol should read it. It opens up your mind to the fact that alcohol is a poisonous drug, as dangerous as any other drug but one that has been made socially acceptable through advertising and brainwashing. It is incredibly dangerous, destroys lives and here’s the thing – HAS NO ACTUAL BENEFITS. That’s right, there are no benefits to drinking, we have just been brainwashed into thinking there are. Now I know that I don’t need alcohol to be confident in social situations, my confidence will come from the fact that I am an interesting and intelligent young woman with a great sense of humour and a lot to offer any social situation. I don’t need champagne to celebrate, though I can still have a nice dinner with friends and family that will be just as fun. Cocktails poolside will be a lot more delicious (and cheaper) without the addition of alcohol, Christmas will be filled with cheer from family and friends, not mulled wine…no more empty calories and the best bit- NO MORE HANGOVERS! What a brilliant start to 2017, I am finally free, no addictions or negative coping mechanisms. I’m looking forward to a year filled with motivation and good times that I can actually remember the next day. I’m looking forward to becoming even more confident and courageous. We should never stop trying to better ourselves instead we should always strive to be the very best version of ourselves. Happy New Year to all my readers and may you have the strength this year to make the changes that will improve your lives. 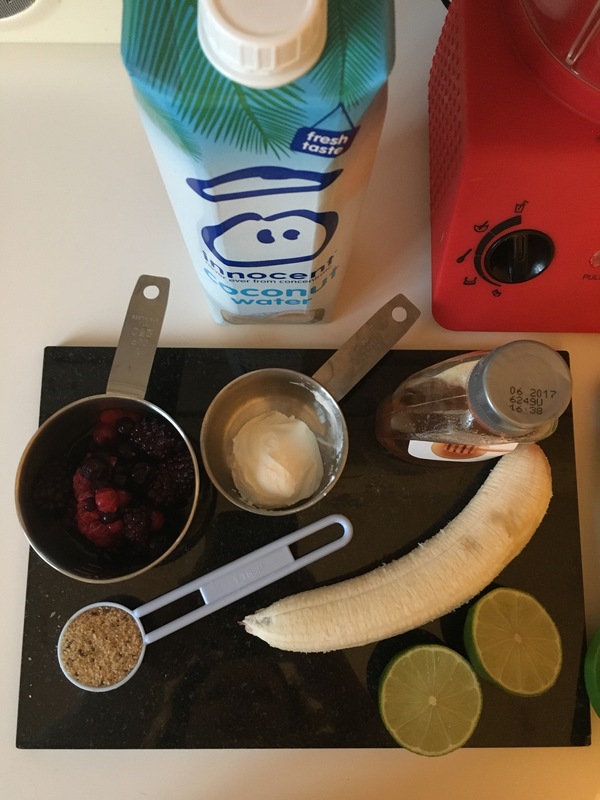 The recipe today is for a mega vitamin smoothie. 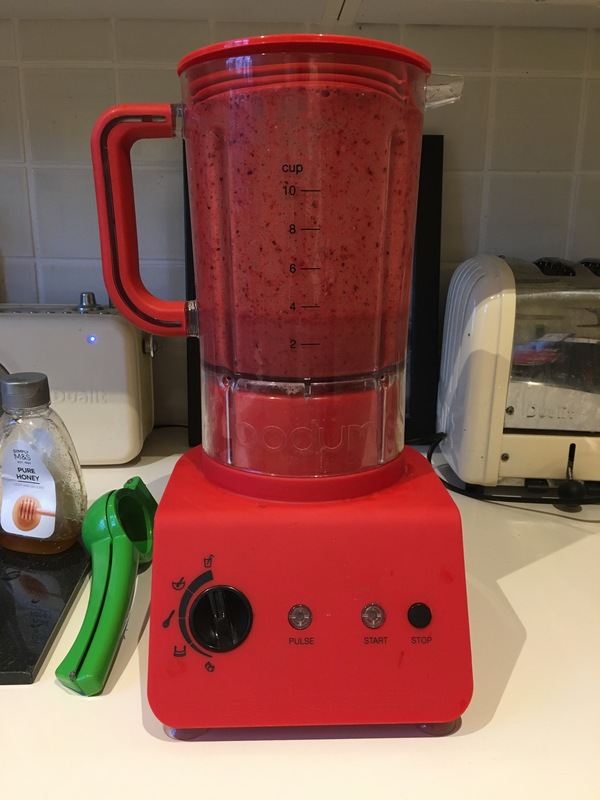 When you’re making a change to your lifestyle or diet it’s so important to keep your body and mind fighting fit and this smoothie is packed full of vitamins and nutrients that will do just that. Simply blitz and take to work or on your commute for the best start to the day, this really is what I call good mood food! So what’s so good about this smoothie? 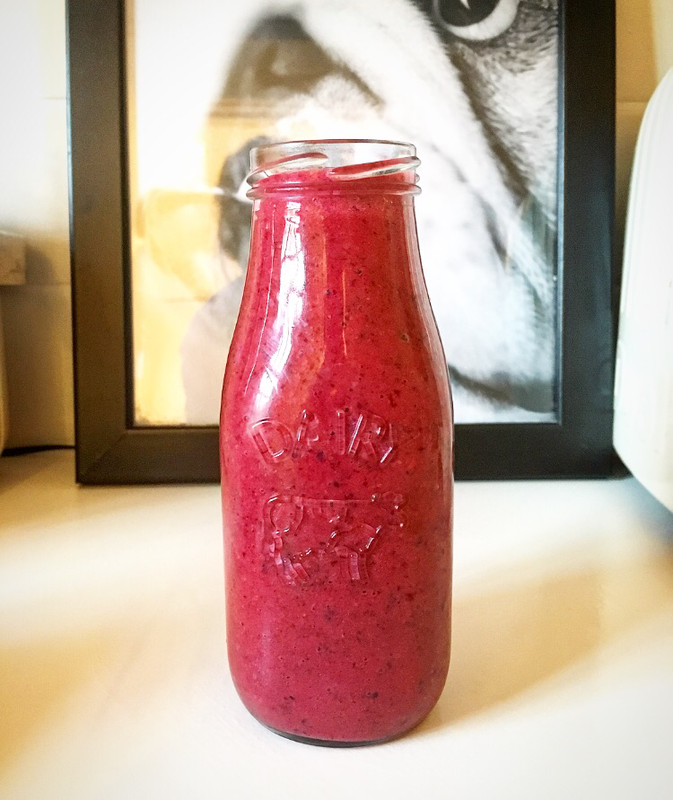 Berries are really useful when it comes to detoxing as they are full of antioxidants. 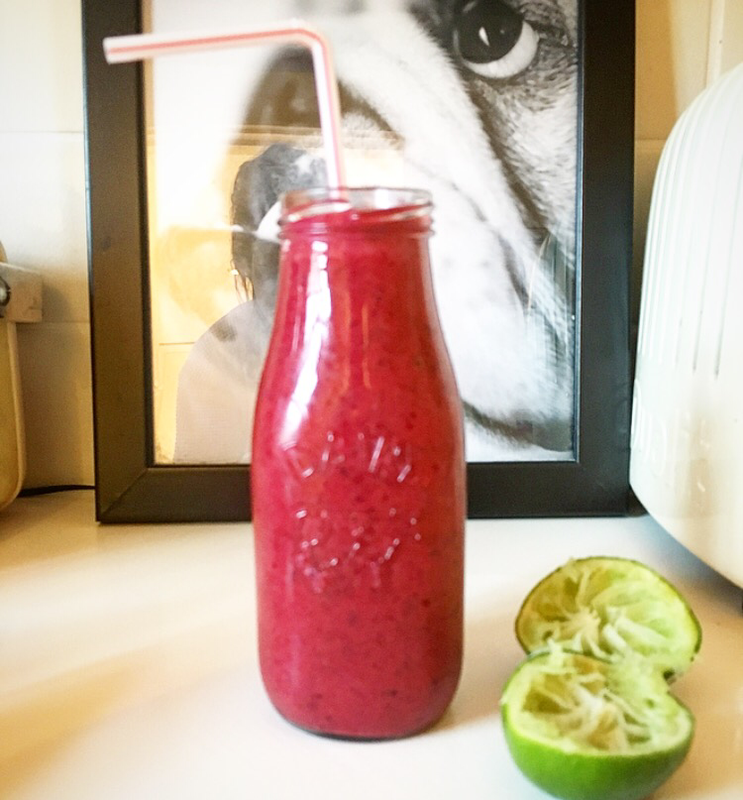 They’re high fibre plus naturally sweet so help the smoothie taste amazing! Lime juice contains vitamin C which is great for boosting the immune system. It also aids digestion and helps our skin too. Bananas are an excellent source of potassium, which helps to lower blood pressure, they’re good for our hearts and can even help fight cancer! Bananas are also great for mental health as they contain tryptophan, an amino acid that aids memory and helps boost our mood! Coconut water, as well as being low in calories, is packed with antioxidants, amino acids, vitamins and minerals like calcium (good for bones) and magnesium (calms nerves and anxiety). Greek yogurt is one of the healthiest foods on the planet! As well as being packed with nutrients eating it can help us burn fat and keep within a healthy weight range. Flax is a good source of omega 3 and can help balance out any cravings. Last but definitely not least chai seeds are among the healthiest foods in the world. They’re packed with fibre, protein and omega 3. Honey, to taste, this will depend on the sweetness of the strawberries and the ripeness of the banana along with personal preferences. 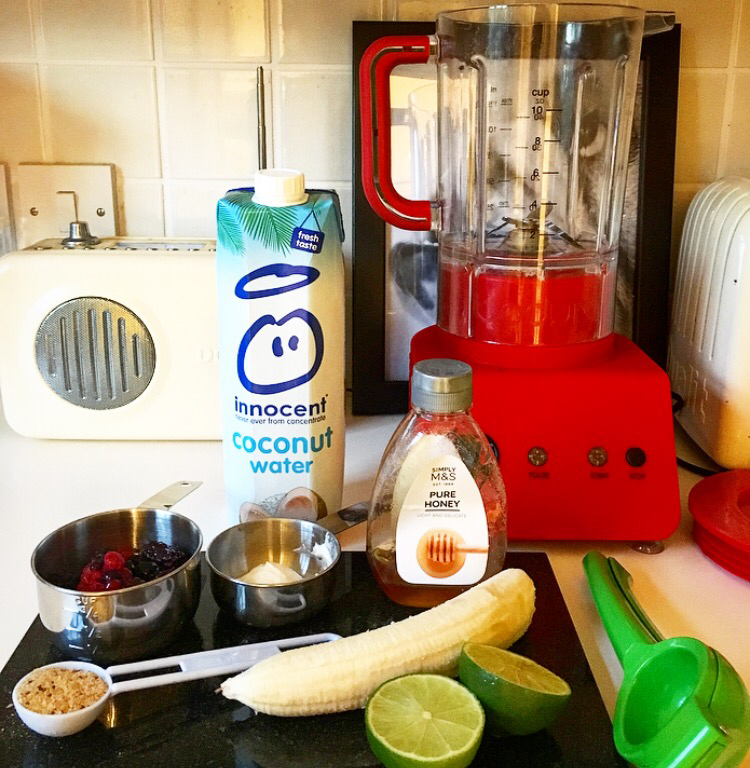 Put all the ingredients apart from the honey in a blender or liquidiser and blend until smooth. Check the consistency, add a little more coconut water or water if you like a runnier drink. Taste and add the honey as desired. Interesting post. Quitting alcohol has been on my mind but I haven’t figure out what to replace those “rewards” at the end of a hard day with. My love of wine is partially about the ritual of opening the bottle, pouring it into the special wine glass, the color, the taste, the fun of tasting wines from different regions. And yet, as you describe, drinking is also what I do to numb out the anxiety and panic after a day at work. When I get into the full blown – I can’t breathe and I want to jump out of my skin – grabbing a shot of something feels like the only thing I can do to stop things from getting worse. I’ve tried to change to stopping panic with herbal teas, meditation, walks and yoga. So far, limited success with that. I hope you have a future post on how you make this not feel like deprivation.